Lanvin will launch Eclat d'Arpège Eyes On You, a new limited edition flanker to 2002’s Éclat d’Arpège, which was a flanker to 1927’s Lanvin Arpège. Eclat d'Arpège Eyes On You follows last year's Éclat d'Arpège Arty. The fresh fruity floral was developed by perfumer Karine Dubreuil, and features notes of lemon, lilac, green tea, peach blossom, Lebanese cedar and white musk. 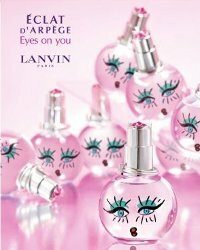 Lanvin Éclat d'Arpège Eyes On You will be available in 50 and 100 ml Eau de Parfum. The bottle is too cute. Probably won’t be able to find it near me. I have Éclat d’Arpege and forget to wear it. This sounds pretty similar. Must get mine out. Bottle is either really cute or really creepy. Haven’t decided which. Although, you know, people said “doll head smell” about Eclat d’Arpege, didn’t they? So maybe this is also quite clever. Yeah, I want to think the bottle is cute, but I think it does veer more creepy. Reminds me of the Anna Sui Dolly Girl bottle, but not as appealing. Notes sound lackluster, but as we all know, a list of notes often seems to have nothing to do with how the fragrance actually smells! I’m going for “creepy”: not as bad as Dolly Girl (which horrifies me), but pretty unsettling. Agree, totally creepy. Makes me think of that very odd, unpleasant doll that came with Marni. +1. Gives me the chills. Well the name of the juice explains the bottle sort of. Wouldn’t really want those eyes peering at me from my dressing table, but YMMV. Right? It’s like Sylvester the cat after he eats the alum or whatever that was. Wouldn’t want it staring at me either..Lavin is going creepy. Member last time someone said the writing on the bottle looked like something painted on the door from The Shining? Funny, because we tend to think of unnerving perfumes as quite a positive thing but creepy bottles as necessarily bad I think I’d rather have an unnerving object on my dresser than an unnerving scent-aura following me around all day! But when it comes to horror, I guess its all subjective. I’ll out myself as a fan of the original Éclat d’Arpege, though I barely touch my bottle. It’s a happy, refreshing scent with little to no lasting power. Harmless, really, and I think there’s a time and a place for a scent like that. I’ve not tried the flankers but it seems based on description that they maybe skew even more fruity-floral than Éclat? I’d smell it out of curiosity. The bottle looks like someone took Éclat and drew on it with their own markers. It has that “I’m doodling a face in my notebook” look. Eh. With that bottle design and the composition of notes, it appears that Lanvin is trying to appeal to a younger audience.